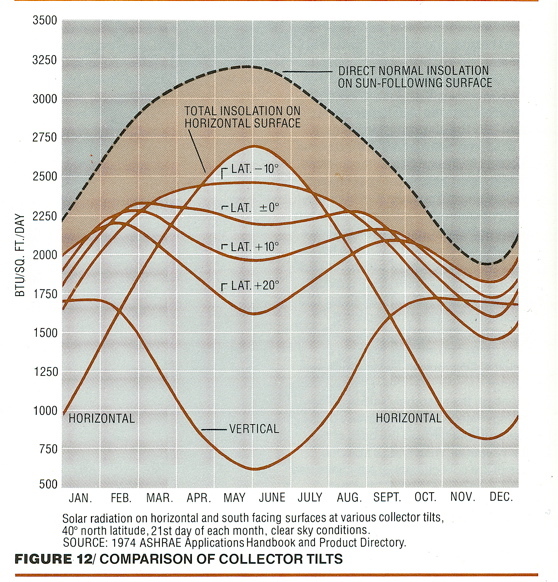 The use of the sun's energy is so common, we tend not to think about it in a technical way. Early cultures (worldwide) got a reasonable start with it by trial and error, ingraining their cultures with construction and agricultural uses of solar energy. Many even incorporated it into their spiritual practices. All this happened without classrooms, textbooks or calculators. Modern life has largely taken us away from a focus on solar energy—unless it's a recreational or gardening related issue. Modern technology and fossil fuels have made this possible. All well and good unless you count extraction and pollution as a social cost that has already turned out to be too expensive for some (Santa Barbara, 1970, Prince William Sound 1989, Gulf of Mexico, 2010, and a long list of other damages and disturbances). This source of energy is as dependable and renewable as anything we'll ever have. It can give us direct heat, building heat and hot water, and electricity. No cartel, business, or government can block us from getting it. All we have to do is make up our minds to tap it and to keep the technologies that transform it for us free from monopoly, collusion, and unfair competition. Every KWH and BTU we obtain from it displaces conventional energy providers like fossil-based, for-profit enterprises, and petro-centered dictatorships around the world. 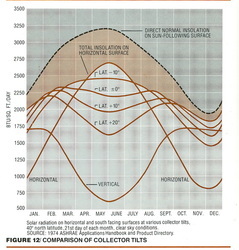 Collector tilt angles above horizontal are important in deciding when you wish to collect the maximum amount of solar energy in a specified season. The exception to this concern is when photovoltaic solar (electric) panels are mounted in a dual-axis tracking array atop a pole mount. In THAT case, the frame tracks a direct, perpendicular path to the sun's rays, so it's energy collection is always maximized. 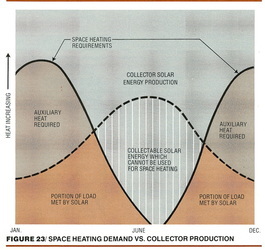 Many could be critical of the rightmost image below which shows large portions of the heating season where solar could not supply 100% of the heat required and thus the back-up system has to work. Actually, if you built a solar system to handle 100% of the heating load on the coldest day with the least insolation—you would have wasted money because much of what you collected throughout the year would be useless, wasted potential heat. Your system size might be fine on an apartment building where more of its seasonal collection could be utilized by other inhabitants. This has always been the economic reality of energy systems. 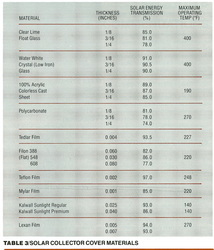 In hot water heating, one faces the same principle on a daily basis. 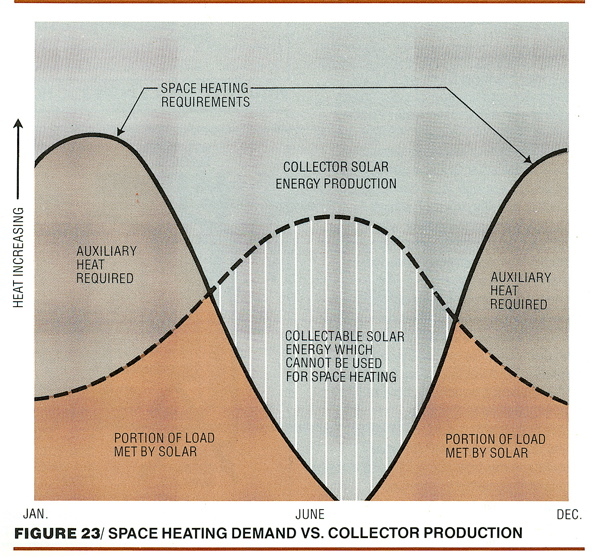 When you leave home and do not consume solar hot water that's been heated for you, the hot storage stagnates. The pump won't run because the tank is satisfied, and you just lost that day's collection. Like the muscle and health business— "Use it, or lose it." Wash clothes on multiple days each week, not all in one day! The main thing is that fossil-based economies are built solely on non-renewable resources. There are no magic bullets there; only delays for the inevitable at increasing social cost. Where will the prices, shortages, and fights over fossil resources go in the future? Up, up, up! The laws of economics and human nature will not change over time. But if you're a fossil-based business (and the biggest ones have LOTS of influence over public policy) every solution looks like a plan to increase supplies by whatever means and at whatever cost is necessary. And a culture that is more dependent on non-renewable resources will accept all the consequences that go with that. 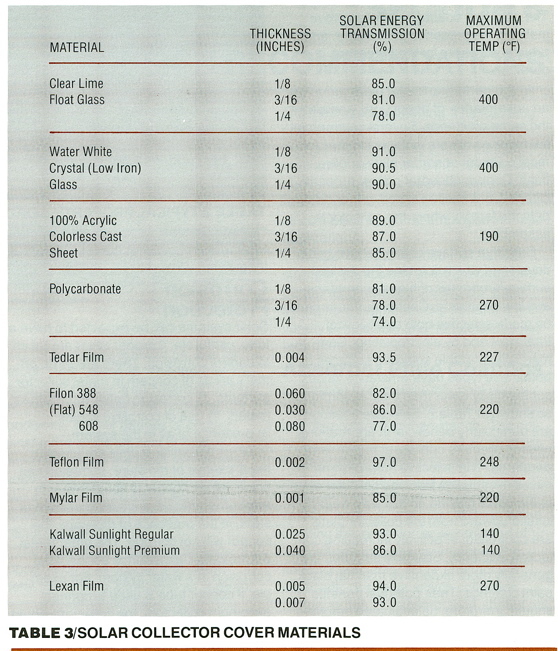 Renewability is the only solution for our energy use. Conservation of energy is the seed which can grow a renewables-based economy that sustains itself without all the drama, damage, and dependency of non-renewables. Other developed nations have taken such important steps, deflecting away from energy policies like those in the U.S. Their transportation systems are less automobile dependent, they have strong public transportation, and they use tax policy to discourage fossil fuel use. Living standards are not appreciably different from our own in those developed nations with less fossil dependency— they just waste less than we do. And this ethic extends to land use, recycling, etc. But unless an economic-political system is already on a policy path that incorporates a move to conservation and renewables, powerful forces will be necessary to make any change (somewhat like the Titanic's momentum being too great for an undersized rudder to steer away from its iceberg in too short a time). U.S. tax policies for residential solar have been inconsistent over the past 25 years. But until the end of Tax Year 2016, they remain at a stable 30% tax CREDIT for renewable installations of solar, wind, and micro-hydroelectricity. With such a policy in place, the next big challenge is to help people understand the residential renewables as new construction or retrofit possibilities. Sadly, there is also a dearth of understanding in the conventional building trades and in contracting. A contractor dislikes going out on a limb for something that might generate repeated call-backs that threaten his profitability. Therefore, the solar industry needs to do an increasingly better job of education and marketing to let the public understand the range of possibilities. Home construction is nearly always a family's most expensive asset investment. Being (conventionally) safe is too often the case instead of taking an (alternative) for which one may be sorry in the future. Neither is what I call "solar patriotism" an answer. Charging masochistically into building a solar home or retrofit because it's the right thing to do, or because it's trendy, is not the proper motivation to proceed. Solid numerical information and forecasts should be the reason. You should expect a timely payback from your solar investment. It's okay if you want to count the "warm fuzzies" or the smugness you feel from doing the right thing, but let that be your icing and not the cake itself.